Poultry management systems are capitalizing on the bird’s specialized vision to optimize performance. Spray-Vac Spectrum, a specially-adapted spray-vaccine stabilizer, not only protects and preserves vaccines for stronger protection, it also visually highlights the vaccine. Birds see their sprayed vaccine droplets reflecting in the fullest possible spectrum, and more intensely under any lighting conditions. Vaccine stabilized with Spray-Vac Spectrum transmits every visible wavelength of naturally-shifting daylight, incandescent, fluorescent, HID and the newest color-shifting LED. Poultry respond to Spectrum, preening vaccine drops more aggressively and more completely, increasing contact with mucosal tissues and helping achieve a more ideal dose and full vaccine protection. Figure 1. 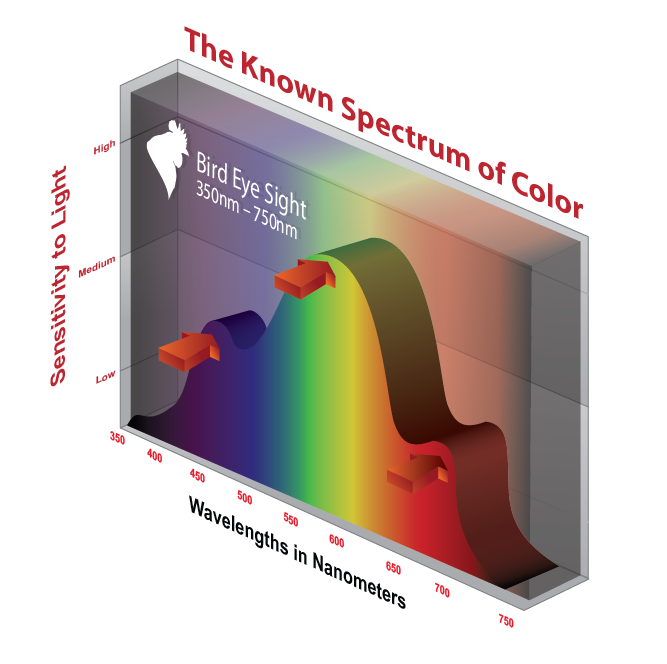 Humans are most sensitive to light at about 575nm, ranging from 400 to 700nm. Like dogs that hear higher frequencies and elephants that hear lower, birds’ specialized eyes let them see a broader range of colors than humans can imagine. Artists can’t truly show us these colors because they don’t exist for us. When depicting the avian color spectrum on charts, artists often extend the most extreme colors we can see, the colors out on the fringe of our perception, farther out into the unknown range we can’t see. Scientists assign wavelength numbers and names like ultra-violet and infra-red to these extreme frequencies, but we haven’t really experienced what they look like. Birds see them because, instead of a human’s three types of cone cells, they have four. Instead of a human’s three types of light-filtering oil droplets, they have five. Instead of a lens that blocks some of the ultra-violet frequencies, their optically-clear lenses let it in. Finally, although it doesn’t see colors, their completely unique pineal gland senses light as well. This higher level of light and color perception means birds likely see objects reflecting light with more eye-catching hues than the blended white light we see. Well developed vision helps birds in their natural habitat more easily recognize and discriminate among food sources and other bird’s feathers, many reflecting UV light. Researchers have used different methods to measure avian color vision. Some used instruments to sense the electrical impulses from cone cells when they were stimulated with light. This technique tells you which wavelength most excites a cell type, but it doesn’t tell you how a bird interprets this one signal, pooled among those from countless different cones all at once. Another way to measure the compound total of all signals and the bird’s perception is behaviorally. Researchers train birds to peck a light source when it shines by giving a food reward. Then they filter the light to show only specific wavelengths to the bird. Gradually increasing the light’s power, they can find the threshold intensity or brightness when the bird first sees it and responds. This tells them two things: 1) which wavelengths the bird can see and 2) how sensitive the bird is to the intensity (dimness or brightness) at each wavelength. Poultry respond to all the wavelengths we see, and many we can’t. These behavioral tests are better at allowing the full expression of a number of interconnected pathways, all culminating in one easy to interpret response from the bird. The graph in figure 1 shows the range of wavelengths visible to humans, from about 400 nm in the violet range up to 700 in the red range. The curve is peaked in the center because those middle frequencies are the ones we are the most sensitive to, meaning we see them easily even if they are dim. 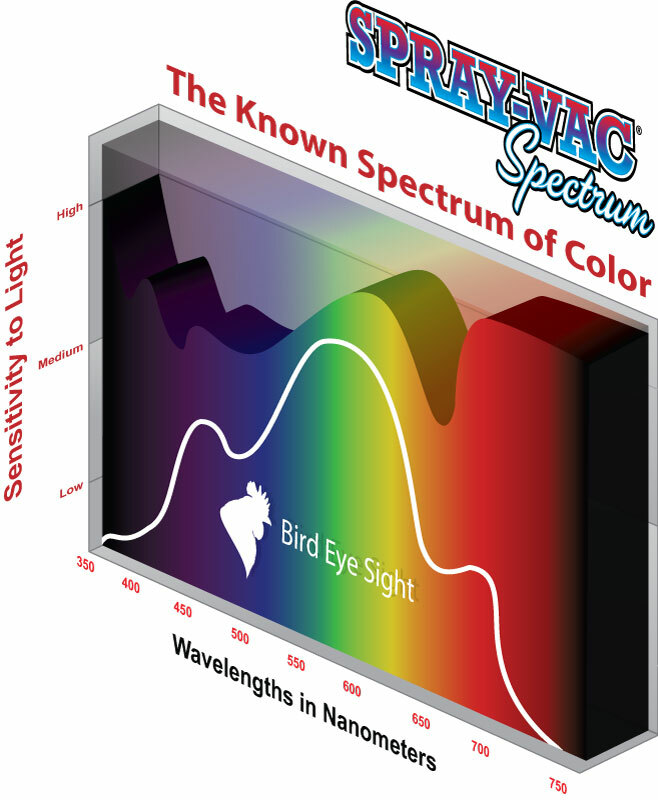 A similar graph for poultry is in figure 2, with their broader spectrum of visible wavelengths. Not only is their range broader, their curve is elevated because they are more sensitive, seeing the fringe colors more intensely. Think brighter. Their heightened sensitivity is most pronounced in the ranges of 400-480 nm and 580-700 nm. Figure 2. Birds see some colors more brightly, especially in the ranges 350-480nm and 580-750nm. There’s important practical research confirming how important color is to poultry. For example, chickens offered different colored food and water have non-learned preference for black first, then green and last red. It’s not surprising considering how food colorings are created. Black food colors simultaneously transmit many different wavelengths of blue, yellow and red, presenting a broad visible spectrum to the bird. Likewise, the second-most chosen color, green, presents only two spectral frequencies for yellow and blue. Finally red, the least preferred color, presents only a single primary color, stimulating the smallest area of the birds’ visual range. Clearly, birds rely on visual stimulation. It’s up to us, having brains bigger than our eyes, to manage their visual stimulus to optimize the production environment. Examples abound in the world of lighting manufacturers, who work diligently to ensure their products are tuned to a flock’s visual needs, even when these needs vary with different stages of production. In nature there are examples of a single, specific color triggering a response. Birds learn to select ultra-violet reflecting seeds and insects for their food value. Similarly, they can learn to avoid insects with chemical defenses, many of these transmitting red wavelengths. When a behavior is learned, birds respond well to a narrow wavelength of single color. However, when a new, unfamiliar object or stimulus appears, poultry focus on it and respond best when they can see it more fully. Naturally, this color-stimulated selection is enhanced when birds can see the reflected colors better, meaning they see a broader range of wavelengths, and also see the colors more brightly. As in the example with colored food and water, presenting a new object or substance to the bird with a full spectrum of reflected light attracts the most attention, and failing to present the full spectrum can limit the bird’s perception and response. 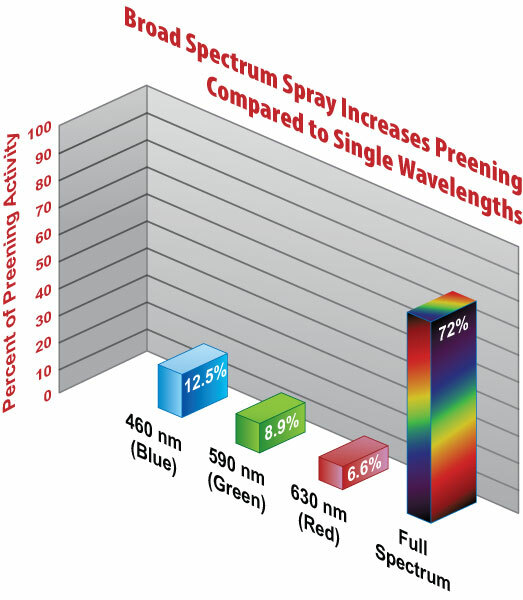 Sprayed vaccine drops are frequently clear, reflecting almost no light, or a single primary color with a wavelength that does not encompass the entire visual spectrum. Both situations limit each bird’s, and therefore the entire flock’s, behavioral response to the vaccine drops. 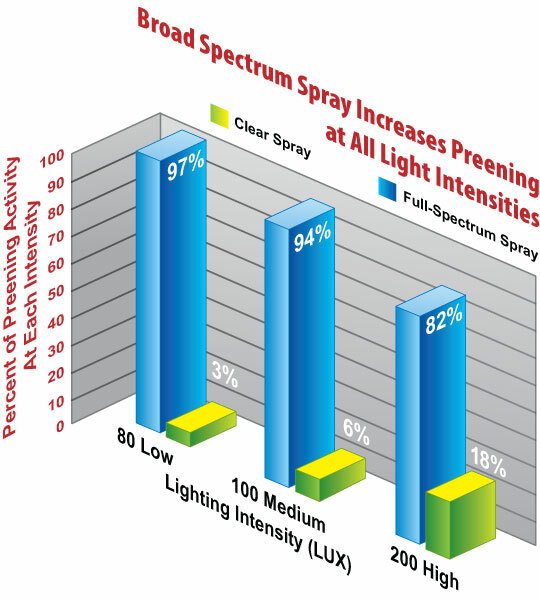 Spray-Vac Spectrum transmits color frequencies from across the entire avian visual range, ensuring the sprayed vaccine droplets are visible in all wavelengths of shifting natural or artificial production lighting. What’s more, each droplet’s spectral wavelengths are amplified in the extreme upper and lower frequencies, so the birds see these wavelengths even more brightly. Spectrum’s reflecting droplets trigger a more intense preening response, causing the flock to uptake more vaccine, faster. By adding Spray-Vac Spectrum, your spray stabilizer not only protects, preserves and promotes vaccine activity, it also makes your spray more visible across the whole spectral range in any light, triggering better, more consistent vaccine uptake by the birds and greater security for your flocks. Figure 3. Spray-Vac Spectrum transmits colors across the entire avian range, and amplifies wavelengths in the more sensitive fringes. Figure 4. Behavioral preening responses to clear or Full-Spectrum sprays in low, medium and high intensity lighting. Figure 5. Behavioral preening responses to single-wavelength or Full-Spectrum sprays.